Hornets are omnivorous wasps that are part of the genus Vespa. They are part of the wasp family including yellow jackets, so they all have similar looks. Hornets are seen all over the planet, including in North America, Europe and Africa. The majority of them reside in Asia, however. 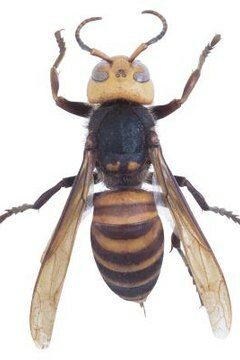 Mature hornets typically reach lengths of approximately 3/4 inch. Yellow jackets are usually smaller than hornets, but just by a tad. Both hornets and yellow jackets tend to have sturdy and robust physiques. Hornets generally are light yellow or white and black in coloration. When they're in relaxation mode, they close their wings from top to bottom. Hornets bodies' have soft and even textures. Stinging in hornets isn't overly common -- less likely than yellow jackets. When they sting, it's generally a response to persistent attempts to approach their nests. Stings from these highly social creatures usually just lead to redness, swelling and mild pain at the site, although the stings can be dangerous to people allergic to the sting venom. Paper is the primary component in building hornet nests. The "paper" they employ is made up of diligently chomped segments of leaves and wood. Tree bark is a common element in their nests, often from plants such as crepe myrtles. Hornets typically establish their nests on plants, sometimes are high in trees or low in bushes. Hornet nests are even occasionally seen connected to man-made buildings. They vary wildly in size, with possible diameters ranging from a few inches to about the size of a basketball. Hornets reside within colonies that consist of practically countless workers and single queens. The colonies also include juveniles. The workers look after the youngsters and provide them sustenance. Apart from the queens, no other females in the colonies breed. The females are workers that handle a multitude of duties, from collecting food to defense of the colony. Colonies often experience rapid growth over the course of the summer. Hornets are often regarded as being helpful insects, as they regularly consume creatures we consider nuisances, specifically fellow bugs. Their diets are heavy on slugs and arthropods, too. After they seize their desired prey, they chew on the bodies to soften them and give the prey to the swiftly developing youngsters. Mature hornets typically feed on nectar and pollen, although some occasionally munch on fallen fruit. Colorado State University Extension: What is a Wasp-Hornet-Yellowjacket-Bee?